There’s something oddly disturbing about watching Joshua Wong speak. It’s a strange feeling that you’re seeing something much more than what is before your eyes. It begins to reveal itself in the first few minutes of Joshua: Teenager vs. Superpower. After our initial introduction to the 17-year-old Hong Kong native at home with his family, we are shown earlier footage of Wong at age 14, heading out for a day of after-school organising. Wong and his close friends take to the city streets to gain interest and volunteers for their new activist group, called Scholarism. What has spurred Wong and his companions into setting up this assembly is the news of Mainland China’s rapid encroachment into the fabric of Hong Kong’s society; specifically their intention to force HK schools to follow their National Education plan. This new plan would instill a pro-Mainland agenda and values and limitations to education for Hong Kong students, starting as early as primary school. The fiercely independent Hong Kong populace rejected this proposal, stating it was “brainwashing” children into being good, obedient little Mainlanders, and coercing them to put aside their own unique, cosmopolitan culture. We see Wong’s group grow from a handful of nervous but game middle- and high-schoolers, to a startling legion of believers from across the region. Many of those joining convinced by the skinny, bespectacled boy whose street speeches and tireless rallying call to them. Here is the magic of the story and its subject: Almost from the outset, at all of 14 years old, to hear Wong discuss the issues he and his compatriots feel so strongly against, with such focus and strong idea of their goals, is unnerving. At an age when most kids would be playing video games, spending time in PC cafes, or even studying, Wong knows he’s meant for other things. Everyone around him seems to get it, too, as they follow his lead and stand enthralled and invigorated by his speeches. Hearing Wong make clear exactly what Hong Kong has to lose if they give away their educational autonomy to Mainland China, with such force and power emanating from this baby face atop a gangly frame that doesn’t look strong enough to hold him up, is mesmerising. Even during his earliest meetings with the press, Wong is totally composed, without a visible ounce of nervousness as he calmly delivers Scholarism’s complaints and demands before a phalanx of cameras. His assessments about his interactions with the Mainland-approved Chief Executive of Hong Kong, CY Leung, the man responsible for putting up absolutely no resistance to China’s changes to his island, are canny and practical. Wong knows when he’s not being taken seriously, or written off as a troublemaking kid. Instead of taking these denigrations to heart, Wong and his Scholarism cohorts use them as fuel to counteract and set up new protests. Every so often we get to meet someone who one senses is not entirely of this earth, or of this dimension, there’s something innately different about them; I believe such applies to Joshua Wong. To view him as he comes face to face with the massive tide of the Mainland government and law enforcement; refusing, protesting, forcing them back with his fiery speeches and immovable action, is like watching something mythical and ancient. Being a quiet, subdued kid, totally anonymous as he walks through the Hong Kong streets to school; the change in Wong when he is speaking before a crowd is fascinating. The surety in his conviction, the clarity of his position, the power in the voice emanating from this thin, wiry teen; if not for his unexceptional stature and youthful face, one could picture Wong as an ancient general galvanising his troops before a battle against an invading horde – which is exactly what he is doing. It is as if the spirits of Hong Kong speak through the boy, using him as a channel to keep its citizens from forgetting who they are. As their numbers and influence grow, Scholarism becomes a force to contend with, and Wong is frequently featured on worldwide media, even as he is banned from Chinese internet searches. Scholarism begins to strike a bit of fear into older HK activists, who plan organised protests after it is announced that China is reneging on its promise to allow Hong Kong to hold their own free and fair elections. The outrage at such action instantly spurs on the student activist army and their spontaneous gathering and occupation of the main avenues of Hong Kong’s commercial centres becomes what we will know as the Umbrella Revolution. The umbrellas initially used to stave off tear gas attacks by the police, turning into a symbol of Hong Kong’s struggle. The younger protesters eschew the elders’ ideas for a more methodical demonstration, and instead inhabit the main business areas in four locations over four grueling months. After the long duration and the unexpected refusal of China to even acknowledge the protests, much less negotiate; passions rise, tempers flare, and sudden actions meant to force reaction result in arrests and injuries, with Wong and many of his compatriots arrested. Still, after release from prison, the already painfully thin Wong attempts a hunger strike to make one last effort before finally giving up. Fear that China will have no compunction about turning Hong Kong into another Tiananmen Square and the disappearance of local bookstore owners who sold books banned by the Mainland haunts the island, forcing Scholarism to consider its further actions, resulting in its disbanding. Far from being written off as well-meaning, but failed idealists, Wong and his fellows decide to change the system from within, beginning a new political party; a much more pragmatic and strategic goal, as some of the members are old enough to run for what few governmental posts are untouched by China. We are given a big hint as to what Wong will be working toward in the next few years – maybe after he’s done with all his college exams. 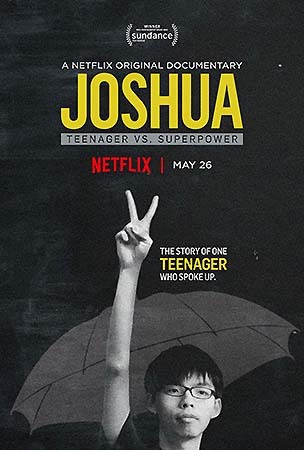 Joshua: Teenager vs. Superpower is a remarkable story that is David vs. Goliath come to life. The tale of the little guy facing incredible – perhaps impossible – odds, and fearlessly refusing to give up. It’s also an important story for this moment in time, when so much seems to be going wrong in the world: Viewing the struggles, strength and positivity of Wong and the Scholarism members will inspire audiences to see that change is possible, even in the face of overwhelming adversity. That these are normal, everyday teenagers, forcing the most populated nation on the planet to stand up and take notice, should be a wake-up call to anyone who’s ever felt a situation was hopeless. 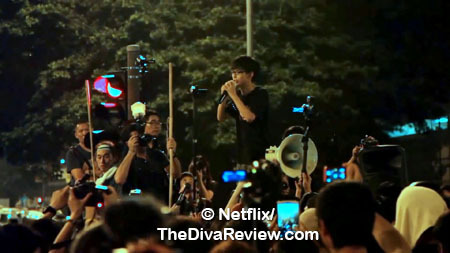 Director Joe Piscatella captures Wong from age 14, when he and the other Scholarism members are already beginning to organise. His framing of Wong’s utter averageness; his loving home, his relative awkwardness and lack of apparent social charisma that could even be considered shy, juxtaposed against the force and fury of Wong with a microphone in his hand, motivating thousands of students to save their own lives and culture, is stunning. Getting back to Wong’s family, while we meet his parents and hear Wong talk about his Christian faith and how a mission trip inspired him to look out for others; I kept wondering how his mother and father felt watching their kid on television being gassed and dragged off to jail by a dozen policeman. For the seriousness of Wong’s plight, the documentary is not without its share of lighter moments. 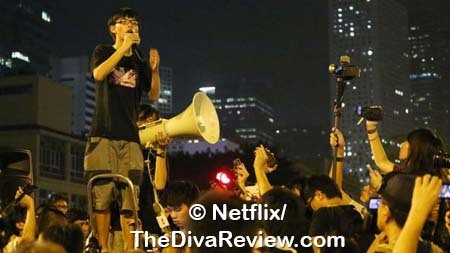 The prevalence of Scholarism member Agnes Chow, is interesting in a fan-fictiony way. Not to take her dedication to their cause lightly, and her presence adds great colour commentary to what Scholarism at large was enduring, but from a purely gossipy viewpoint, it seems that there might be an additional connection for young Chow, as her face fairly lights up when discussing Wong, and after her addition to Scholarism, there’s rarely a shot of Wong that doesn’t capture Chow very nearby. Sadly, unless there’s a lot of cut footage, Wong, either by the calling of his chosen political path, or the universal awkwardness of the teenage boy, doesn’t seem to have noticed the hearts flying out of Chow’s eyes. Fellow Scholarism founder Derek Lam is good for a few laughs as he seems much more rooted in this earth than his colleague; reeling off pop culture heroes and inspirations of Hong Kongers everywhere, including Bruce Lee (Who was from San Francisco, but okay.). Even these mirthful moments remind us that we are looking at a movement that was started by children. Kids who assessed and addressed the problems that not only they would face, but as Wong forcefully insists, generations after them would endure if the identity of Hong Kong was lost. Whether due to their lack of awareness of the consequences, or the heedlessness of youth, Scholarism and the student groups that sprang up beside them, faced their enemy head on without flinching until the suffering became unbearable and long after the adults gave in. Whatever the source of the flame that burns in Wong that dedicates the young man to face constant danger not only shows no sign of fading with age, but indeed becoming a keen blue laser aimed at Hong Kong’s Chinese oppressors. I have a feeling there is every chance Joshua: Teenager vs. Superpower is only the first cinematic document in what - for better or worse - will be a very interesting life.